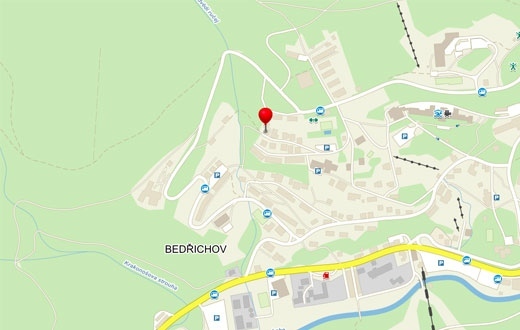 Our pension is in Spindleruv Mlyn. There is a forest near the pension. Parking is possible, even in winter time. We offer an accommodation in double rooms, three and four bedrooms. Every room has its own bathroom, WC, TV+SAT. There is a common room, dining room with balcony and common kitchen. It takes ten minutes of walk into the city center. The Town of Spindleruv Mlyn is referred to as "the Jewel of the Krkonose Mountains" mostly because of its unique location in the central part of the Krkonose mountain range. This originally mining settlement has evolved into one of the most sought - after tourist resorts in the Czech Republic. Skiing, alpine hiking, cyclo-tourism and water sports - these all are the activities which attract thousands of visitors to Spindleruv Mlyn all year round. If you are interested in, you can rent any sport equipment in the rental, Maja Sport. Ski center Medvedin 0,5 km. Skibus goes to the ski center St.Peter for free every 20 minutes.